At Mid-Continental Dental Supply we live by our tagline “Your Practice Building Partner”. This is at the heart of our brand, and shines through clearly in our corporate positioning below. Practice Building Support from Mid-Continental Dental Supply Co. Ltd.
• For over 29 years Renew has only been available through dental professionals. This approach creates an “automatic recall system”; which helps to build your practice by maintaining frequent contact with your patients. Opportunities are created for dental professionals through patient appointments for follow up work, and replenishment of Renew denture cleaner. • The automatic recall system also helps to foster strong relationships with patients. This is supported by a positive experience with the quality of products like Renew; and through more frequent contact. • Our products and services are focused exclusively on dental professionals. Dental professionals enjoy a rewarding profit margin through selling our products. • Mid-Continental will provide attractive free office signs for your practice. These counter stand-up posters (pictured below) insert picture below has a fold out leg to keep it upright. This proves highly effective when placed in the waiting room. • We can provide personalized customer labels (co-branding) to place on Renew bottles. 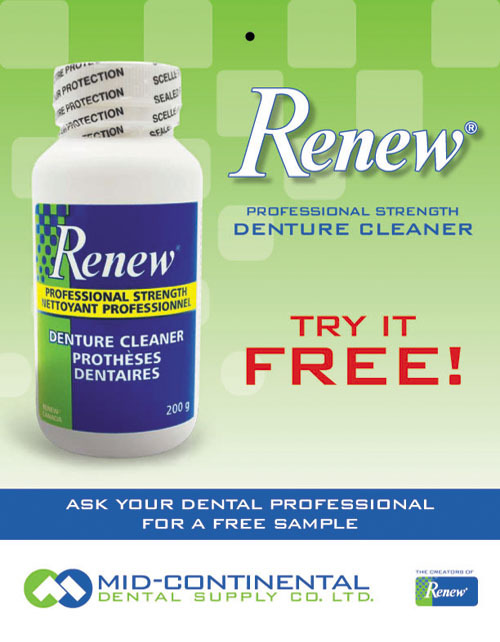 • Mid-Continental supplies dental professionals with 50 free patient samples with every case of Renew. This provides you with an opportunity to grow your practice risk free. • Mid-Continental Dental Supply is continuously researching new and innovative products and services, such as Biotene, to assist you with building your practice. Watch for new and exciting dental products and services in the near future!